A Time For Choosing: Congratulations Track and Britta Palin! With all of the horrific news today, this is a real pleasure to report. It seems the Palin family has grown by one, As Todd and Sarah Palin's oldest son Track, following in his parent's footsteps, married his high school sweetheart, the beautiful Britta Hanson. 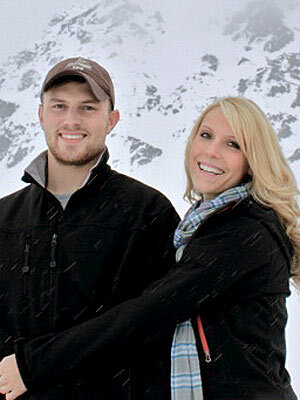 Sarah Palin's eldest son, Track, 22, recently married his high school sweetheart, Britta Hanson, 21, in a small ceremony in Hatcher Pass, Alaska. "Our families couldn't be happier!" the Hansons and Palins tell PEOPLE in a joint statement. "These are two hard working, humble, active, studious young adults who grew up together. We're tickled that after two decades of friendship we proudly witnessed their marriage, knowing their new life together will be blessed." The couple will have a larger wedding celebration this winter at Alaska's Alyeska Ski Resort "when extended family and friends from the Lower 48 can travel north for a long ski weekend," says the statement from Sarah and Todd Palin and the Rev. Duane and Elizabeth Hanson. Britta and Track have been dating since high school. When Track was stationed overseas in 2008, Sarah Palin used to joke that she hadn't heard from her son since his deployment, though his girlfriend had. 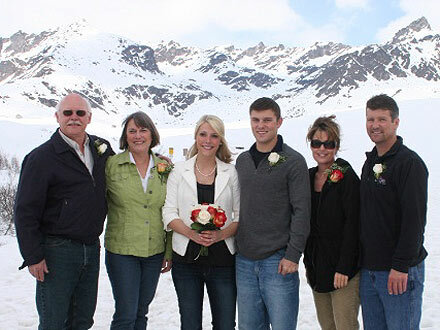 "The Hanson and Palin families are ecstatic and proud that Britta and Track married in one of our favorite spots in America, spectacular Hatcher Pass, Alaska," says the statement. "It's a site we've all shared fun memories of skiing, snowboarding, hiking and snowmachining." We wish the Track and Britta a lifetime happiness and success.